New tools and strategies for HIV prevention are complicating the business of vaccine development. But, as the Boston conference revealed, HIV vaccine research continues to advance at a torrid pace. Talks at the annual AIDS Vaccine Conference, held this year in Boston, reflected dramatic shifts in the HIV prevention landscape. The conference also stressed the work of young and early investigators. VAX Science Writer Regina McEnery sat down with longtime AIDS vaccine advocate Bill Snow, appointed six months ago to lead the Global HIV Vaccine Enterprise Secretariat, for his perspective on the conference. This year, the opening plenary talks didn’t focus solely on vaccines. Is this the first time the conference has included talks on other strategies? People have always had to consider what’s going on in the epidemic. You can’t run vaccine trials in a vacuum. Anything that has to do with the clinical end of things has had to be responsive pretty much on the spot to changes like [antiretroviral drugs] getting distributed more widely and voluntary male circumcision. It just didn’t show up in the titles as much as it did this year. This conference also had a considerable number of young and early career investigators taking on leadership roles or presenting data. What kind of impact did this have on the conference as a whole? I think it had a huge impact. If you look at the program, there were a lot of speakers who had not spoken at previous conferences or held such a high visibility spot. What that does is it makes the conference much more interesting. You hear the people who are doing the work instead of the people who are managing the work, and you tend to hear more specifics. In your talk opening night you said the field is “short on research and long on little tweaks and new ideas that make for indecision and conflict.” Can you elaborate? It really has been an insider’s game. The few 1,000 [scientists] who work on this are excited; they can gauge the progress and they know the joy of the little victories and the disappointment of little defeats. But in the end, in the outside world, we have to justify what we are doing and the best way to do that is to let people know what we are really accomplishing along the way and not just talk about the pot of gold at the end of the rainbow. You pressed the field to either validate or cast aside the results of the RV144-correlates analysis. Were you chastising the field for taking too long? No. What I meant is that we’re halfway to answering that question and we might be able to answer it without an efficacy trial if we are really smart about it. Right now, people are chasing after what they think happened. We don’t know whether what they think happened is really causative. We need to know that before we start redesigning all our vaccine studies. The University of KwaZulu-Natal (UKZN) in South Africa and the Howard Hughes Medical Institute (HHMI) opened a seven-story, 40,000 square-foot research center in early October that will primarily focus on the twin scourges of tuberculosis (TB) and HIV. The KwaZulu-Natal Research Institute for Tuberculosis and HIV—or K-RITH for short—will occupy five of the seven floors and has already recruited eight of its 10 principal investigators. The Centre for the AIDS Programme of Research in South Africa (CAPRISA) and UKZN will occupy the remaining two floors. The building is on the campus of the Nelson Mandela School of Medicine in Durban. K-RITH, established in 2008, had been in temporary space on the Durban campus. HHMI supplied US$40 million for K-RITH—$30 million for construction of the facility and an additional $10 million to equip the floors, which include biosafety level-3 laboratories that will enable scientists to do hands-on research on Mycobacterium tuberculosis, drug-resistant M. tuberculosis, and HIV. In addition, HHMI has committed $3 million a year for 10 years to fund operating costs and additional funds for recruitment. UKZN contributed $10 million to the K-RITH facility as well. K-RITH’s initial focus has been in five research areas: the development of faster diagnostic tests for TB; characterizing drug-resistant strains of TB; analyzing and characterizing complex immune responses to TB; the study of recurrent TB infections in HIV-infected individuals; and improving the treatment of TB. But the research facility also plans to participate in TB and AIDS vaccine trials. What tools are researchers using to bring HIV’s Envelope protein into focus and what have they learned about its structure? One of the most exciting developments in AIDS vaccine research in recent years has been the isolation of dozens of broadly neutralizing antibodies (bNAbs) from the serum of a minority of HIV-infected individuals. In the lab, at least, these antibodies are capable of neutralizing many of the HIV strains currently in circulation by binding a three-legged, spike-like protein on the surface of the virus called the Envelope trimer, or Env. Scientists are now applying what they are learning from these antibodies to design vaccine candidates that might elicit similar antibodies in people before they are exposed to HIV, and so block infection (see VAX May 2010 Primer on Understanding if Broadly Neutralizing Antibodies are the Answer). 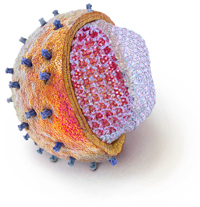 The bNAbs elicited by any such vaccine would attack HIV before it can invade its target cells. Ideally, they would not only target a broad spectrum of HIV variants, but do so potently—in other words, at very low concentrations. But eliciting such antibodies isn’t easy. The regions of Env most susceptible to neutralizing antibodies are hidden by a thick coat of sugars. These sugars restrict antibody access to the underlying protein surface. Many of the protein targets—or epitopes—that are accessible to antibodies, meanwhile, do not elicit neutralizing antibodies, and act as decoys that confound the immune response. But perhaps most importantly, large swathes of the trimer change constantly due to HIV’s extraordinary mutability. This allows the virus to continuously evade immune recognition. Scientists have sought to overcome these challenges by studying how bNAbs latch onto the Envelope trimer (seeVAX March 2011 Primer on Understanding HIV’s Envelope Protein). But determining the shape of the trimer—with or without an antibody bound to it—has been an uphill battle. One way to do so is by X-ray crystallography, which involves beaming X-rays through a crystal of the purified protein and reading how the X-rays are scattered by that passa ge. This allows researchers to determine the precise spatial arrangement of atoms that make up the protein molecule. If the molecule—or the relevant part of it—can be co-crystallized in complex with an antibody that recognizes it, crystallography reveals in exquisite detail how the two interact with each other. Researchers attempting to reverse engineer novel HIV vaccine candidates rely heavily on such imaging. But the HIV trimer poses unique challenges to that approach. Because the complex is structurally dynamic and highly unstable, researchers have had great difficulty crystallizing it in its functional (or “native”) state. To circumvent these problems, some laboratories employ a newer generation imaging technology called cryo-electron microscopy, or cryo-EM, to study the trimer’s structure. Cryo-EM involves snap-freezing a protein in liquid nitrogen. This freezes Env in its natural state. Scientists then use an electron microscope to capture thousands of images of the protein from different angles. These images are then merged to reconstruct a high-resolution, 3D image of the frozen protein’s fine structure. Cryo-EM has often been used to study the Env trimer on the virus. Today scientists are also using a more advanced version of cryo-EM—single-particle cryo-EM—to analyze Env in isolation, affording a higher resolution snapshot of its structure. In one recent study, researchers used this approach to describe Env in its earliest native state, before it binds receptor proteins on the target cell. They found that Env, in its unbound state, has a “doughnut hole” in its center and is quite different from the densely packed structure that emerges at the end of the viral entry process. The images also capture an unusual, cage-like architecture, which likely helps HIV evade the immune system, and show how the triangular pyramid structure of Env hampers access by antibodies. In another recent study, researchers used single particle cryo-EM to take a look at Env at a later stage of the infection process, just after it has docked with its protein receptor on the target cell. They found that Env partially opens up at this stage, exposing parts of its inner surface that it deploys to fuse the virus membrane with the cell membrane. This exposes the inner surface of Env to attack by antibodies. While these cryo-EM models of Env are not as vivid as those obtained by X-ray crystallography, scientists have found them instructive and suspect they could help in the design of HIV immunogens—the active ingredients of vaccine candidates—that induce bNAbs. Already, they are planning to synthesize molecules that mimic the partially opened trimer, a conformation it assumes after it has bound its cellular receptors. A vaccine bearing such an immunogen might induce antibodies that prevent membrane fusion, which is essential to the viral life cycle. Meanwhile, researchers are learning more about how some of the bNAbs prevent viral entry by interacting with other regions of the HIV Envelope trimer. In one recently completed experiment, researchers mixed HIV particles with two bNAbs—b12 and VRC01—and used cryo-EM to study if and how the binding of bNAbs changes the structure of the Envelope spike. They found that VRC01 did not require any changes in Env structure to bind its target; b12, however, did. This might explain why the VRC01 antibody neutralizes a broader range of HIV strains than b12. To learn more about how researchers obtain models of the HIV Envelope glycoprotein, link to this video that details work from the laboratory of Sriram Subramaniam at the US National Cancer Institute.